Now isn’t that the sweetest sight, this picture was captured of the boys chillaxing on a car trip. A wonderful moment that we were able to catch of our boys cuddling . A short while later that image of tranquility was greatly disrupted by a car in front of ours slamming on the brakes, causing us to have to do the same. Lucas and Romeo were both thrown from their resting place. The cat was lucky enough to land on the floor behind the drivers seat, Lucas wasn’t! He flew forward in between the two seats with such force that his face broke the air vent on the dash. Thankfully, he only sustained a small cut on his muzzle and after watching him vigilantly for a few days we were sighing with relief that he was okay. Our pets really should be in seat belts, something I used to have for our Shelties, but once we got big old Lou, I got rather lax about. I keep thinking what would have happened if things had been worse and we had slammed into someone, he could have gone through the wind shield. 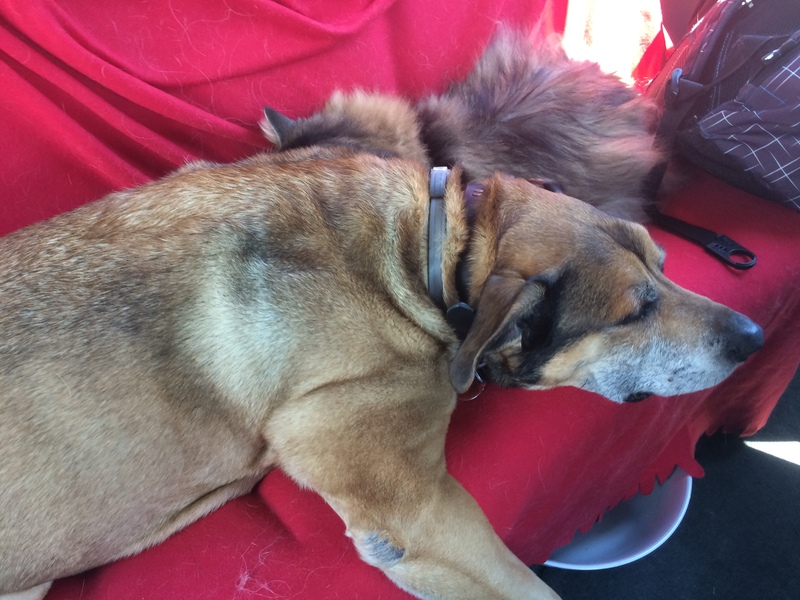 I love to allow the boys to unwind and take it easy when we drive so we let them choose their resting place so that the trip isn’t stressful for them, that’s all well and good if we have a functioning crystal ball! Accidents happen because they are unexpected events. We got lucky that day! Every time I see the broken slats on the air vent I am reminded that keeping our furry family members safe and sound should be a major priority. Something to consider the next time you are about to take a road trip with your pets, are they projectiles? Keep your fur babies safe, the first thing we do when we get into the car is put on our seat belt, we do it without thinking! Our animals have no clue they are in potential danger, as a caregiver, we have to make sure that they are protected.